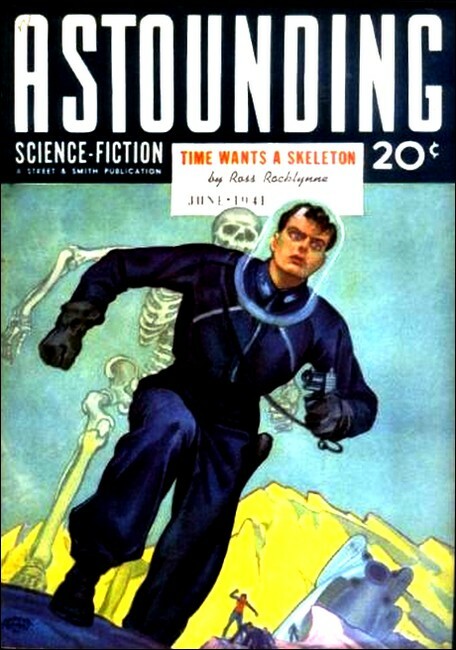 Astounding Science Fiction, June 1941, with "Devil's Powder"
THE screaming and shouting in the galley were the first sounds Captain Bullard heard when he returned aboard the good ship Pollux. At the first wild yelp he bounded forward, knocking a couple of giggling bluejackets out of his way, and reached the pantry door just in time to see a knot of men bear the ship's cook away, struggling and raving. Bullard watched them go and then strode into the usually trim and ship- shape kitchen of the space cruiser. On the Pollux they varied the regulation sky diet of pellet concentrates with one old- fashioned cooked meal a day. "What goes on here?" 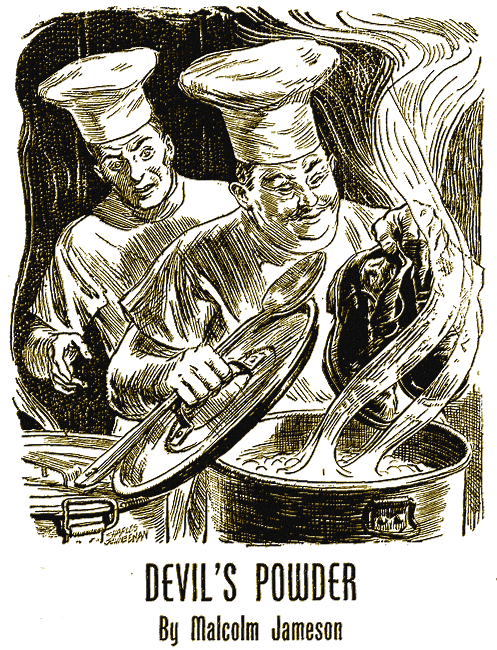 he demanded of a cook's helper, who was sheepishly ladling cakes of laundry soap out of a caldron that contained a mess that started out to be soup. Broken packages of food powders and dinted utensils strewed the deck. The place looked as though a four-inch H.E. had just exploded. "Nothing, sir. Just the chef went nuts, that's all, sir. Like everybody else's doing," said the man, calmly continuing his clean-up work as if it were long-established ship's routine. "He's the third today." Bullard glared. The aerogram that recalled him from his hard- earned leave had hinted at a desperate state of affairs on the trophy-winning ship, but her new captain was hardly prepared for anything like this. "What do you mean, went nuts?" barked Bullard. "What did he do?" "Why, sir, he dumped a lotta junk in this here stew and said it was going to be ambrosia to coax fireflies in, then he pitched his shoes in too 'cause he said they were full of anti-heebie- jeebie vitamins. After that he climbed up onto the range and began dancing, saying he was the great god Jupiter Pluvius and I should do a double backflip kowtow. Then he started throwing things—"
Bullard gave a growl, wheeled and walked out, snapping out orders to the first man he met in the passage to find the exec and the doctor and tell them he wanted them in his cabin at once. They lost little time in getting there, those two. It was a very harried-looking Commander Moore who presented himself, worry and relief struggling to get possession of his expression—worry over what had happened while he had been acting captain, relief at being superseded. A moment later the doctor came in, wearing a look of complete bewilderment. "This is a pretty howdy-you-do," said Bullard quietly, looking first at one and then at the other of them. They both nodded dismally. "Well, go on—say something! Where do we stand, how did it start, and all the rest of it? Make it snappy." "Nine lunatics in irons in the sick-bay just now. Yesterday we shipped off four to Lunar Base for institutional treatment. There have been altogether eighty-four cases, but most of them have gone back to duty. They're still a little cuckoo, but not dangerous. It's a sort of epidemic. Mass insanity, so to speak—"
"Tommyrot!" snorted Bullard. "Give me facts. Is it booze, drugs, or don't you know?" "It is not booze," said the doctor emphatically, "and if it is a drug it is a brand-new kind. We have made every test—there is nothing on the breath, nothing in the blood stream, nothing in the excreta that responds chemically. The psychotic symptoms differ in every case. I can't formulate a rule. It's ... uh ... well, just a general nuttiness. There's no way else to put it. Some get over it and some don't. In either case they fail to remember anything about it, except that they have just had a hell of a grand time and would like to do it all over again. It's very vague, but there is no doubt it's ecstatic." "Hm-m-m," frowned Bullard. "That sounds like a drug to me, and an exceedingly dangerous drug at that. Have you heard of neurobane?" Dr. Herilon shook his head. "It's new. It turned up at home while I was there. The Bureau of Health knows something about it. Burn up the ether until you get the dope, then come back." The doctor flitted from the room, relieved at having been given a straw of hope to cling to. Bullard turned to Moore and motioned to him to sit down. "Begin at the beginning, Moore, and tell me the whole sad story." "I BLAME it on the draft," commenced Moore, "that came to replace the old crew—"
"What!" yelled Bullard, leaping up from his chair. "Have they switched crews on us?" "Practically. The department said we had done such a fine job of training that they thought they would keep on letting us do it. So they detached about half the men and petty officers and sent us a big draft of fresh-caught farmers and said to break 'em in." "Yes, the assimilation of so many new men is always tough. Go on." "That was at Lunar, just after you left. Then we came here to Venus and went on the range for small-arms practice. That is when this wave of craziness began. One little guy down in the fourth division crawled into a scuttle and refused to come out. He said he liked it there, snugly surrounded by metal. Said he was a grade-A rivet and didn't intend to shake loose until they scrapped the ship. We had to cut him out with a flame jet under a cooling spray, he had jammed himself in so tightly." "That was just one. There was the fellow who thought he was invisible, and there was the one who believed he was radio- active. He tried to wreck the sickbay because the doctor wouldn't bottle his breath and pay him for it. He claimed it was pure radon gas and worth a thousand sols a cubic foot. Then there was—"
"Never mind the details. What did you do?" "Doubled up the jimmy-legs detail on the theory it was dope. Two of them went nuts. Maybe it is. Put plenty of sentries around the small-arms range and searched the ship with ultraviolet probers. Not a smell. If there's dope, it's damn cleverly hid. We know the lockers and store-rooms are clean, and every man is gone over with a spy ray whenever he goes to or from shore. All liberty is stopped; the only place they go is to the range and they can't possibly contact the outside there." Moore stopped. He had taken every precaution a human could think of, but the thing had gone on. The doctor and his gang had co-operated nobly, not sleeping for weeks. The trouble was clearly within their field, but the cause of it baffled them. They could not get information out of men whose recent memories were blank. "Bad, bad," murmured Bullard, drumming the desk with his finger-tips. "You bet it's bad—and getting worse." "God, what a money-maker for a gang of unscrupulous crooks," ejaculated Bullard, looking up at, the doctor. The doctor nodded grimly. "And so we can't detect 'em by looking for nose plugs," complained the doctor, "and the nonimmune fall for the stuff, and then forget about it." Captain Bullard handed back the report. "Life on the Pollux," he remarked, thinking over his career on board her, "is just one thing after another." IT was dawn before Bullard laid aside the lists he had been studying and correlating. He had found one significant fact. There had been no psychoses prior to coming to Venus, nor any that had not been preceded by at least one day's firing on the range, though usually it took three consecutive days of that before one of the major breakdowns occurred. That last qualification was one that shook the drug theory a little bit. Could there be a neurotic reaction from too much firing of the pellet guns? Yet Bullard had never heard of it, though he was a qualified sharpshooter himself and had spent hundreds of hours on the range in company with many other men. He buzzed for Moore. "Pick out three men of the last draft who fired both yesterday and the day before and see that they go to the range again today. Have the rest of the party made up of first-time men. And, Moore—"
"I am going to fire the course myself. I am getting rusty." "I tried that myself. You won't see anything there. The range has been searched time and time again—"
"Yes, yes," said Bullard, quietly. "Please see that the party is ready, will you?" He went, in slicker and hip boots like everyone else. In Venus it rains most of the time; the rest of the time it is foggy. But it is an excellent place to get the hang of infrared target finders. Captain Bullard walked down the firing line watching quite casually how the recruits attended to their instructions. He noticed that the ship's gunner was a new man, as were most of the gunner's mates. They continually went back and forth, heavily laden with bandoliers, and issued the cartridges. It was hard to see detail more than a few yards through the persistent mist that prevailed between rain squalls, but to the naked eye all was as it should be. The Pollux, apparently, was doing her customarily good job of making every man aboard an expert in the things he was supposed to know and do. Twice Bullard picked a spot to shoot from and then left it for another, but saw nothing to arouse suspicion. At the third firing point he let loose his first string and got eighteen hits out of a possible twenty, missing the second and ninth shot. He grimaced and reloaded. With the superb fog-penetrating sights the modern guns were fitted with he should have hit twenty times out of twenty even if the range were five thousand meters. He moved once more and shot the course all over. But though he took his time and kept his eyes well peeled to what went on about him, he still did not see what he hoped to see. The rest of the day he stood back of the firing line watching the distribution of ammunition. A gunner's mate would bend over a prone candidate and hand him clips of cartridges. There would be a word of advice, and the burdened bullet supplier would pass on. It was all very regular. The men, in the main, shot admirably, considering they were all boots. After the day's work was over and the men had formed in ranks to march back to the ship, Billiard went over the firing line yard by yard, taking note of the work of the sweepers, who were picking up the spent cartridges and otherwise cleaning up the place. At one spot he paused. Lying half trampled in the mud was a shiny white object. Bullard stooped and picked it up. It was a bullet. It was a small slug of adamantium, the toughest and hardest of all metals, crammed to capacity with the terrific explosive feroxite and would burst instantly on any reasonable heavy impact. He pocketed it, wonderingly, and continued on down the line. Farther on he picked up two more. Then one: then another; then three in one locality. By then a deep frown engraved Captain Bullard's forehead. It was dangerous business to hand green men defective ammunition. Why had these pellets broken loose from their cartridge cases? Had it happened with a sharp jar, twenty men might have gone up in fragments and there would have been nothing left but a muddy crater to show where they had been. He went on to inspect the fences and saw the sentries at fifty-yard intervals. The range, thanks to Moore's precautions, really did look to be inaccessible. Whereupon Bullard, with a pocketful of the dangerous pellets, went back to his ship, walking slowly and thoughtfully. That night two of Bullard's guinea pigs cracked up and were promptly suppressed by the masters-at-arms trailing them. They were strapped quickly in strait jackets and hauled off to the sickbay, mouthing wild nonsense and fantasy. The third took his in another way. He passed out without a sign of violence and went happily to sleep, his face wreathed in smiles of beatific satisfaction. Later, two of the one-day men collapsed, but by morning they had every appearance of being normal, though there was a haunted look in their eyes, as if they had had a glimpse of Heaven and had had it suddenly wrested from them. "LOOK here, Moore," said Captain Bullard, just before quarters the next day, "have you ever heard of the wreck of the Centurion?" Bullard chuckled. "Neither have I. But anyway, she lies a little south of Cupid Rock in the Ocean of Love. That is about forty kilos east of here. I want you to send divers there tomorrow and give me a full report of what you find. We have ten diving outfits, haven't we?" "Yes, sir," admitted Moore, wonderingly. "Take the gunner—what's his name? Stosk?—and those new gunner's mates. Send 'em all down and see that they stay there for as many hours as they can stand it. Understand?" "Good enough. Do it. That is all." "You might take Dr. Herilon with you, too. You never can tell with diving expeditions." "Aye, aye, sir," acknowledged Moore, but there was no hint of true understanding. Nor could there be. Yet he had supreme confidence in Bullard, for all his penchant for doing things indirectly. If he wanted the nonexistent Centurion looked for, that was that. He would look for it most diligently. The following day Bullard watched with seeming indifference as the salvage party shoved off. For that day the work of qualification on the range had been suspended. Fraser, the gunnery officer, went with the divers as was customary. But immediately they were clear of the ship he sent his messenger for Benton. Benton, resplendent in his new gold stripe—an award finally made him after Captain Bullard's repeated recommendations—reported. Benton was junior assistant engineer now, but he was a man that his skipper knew he could rely on, come hell or high water. Bullard opened the cabinet that held the keys to the armory and the magazines. Of those there were only three each. The gunnery officer had custody of one, the gunner the second. The third of the set hung in the captain's own bedroom. "Get gas masks and come with me," was all that Bullard said, taking down the key to the armory and slipping it into his pocket. They let themselves in and walked past the workroom where the loading machines were, and the powder test ovens. Neither cast so much as a glance at the row of twenty symbolic cutlasses neatly racked by the small-arms magazine door. The skipper of the Pollux used another key and led the way into the place where many cases of pellet-gun ammunition were stacked. "I may need some mule labor here," said Bullard with a smile. "As a freshly commissioned ensign, are you above that sort of thing?" "You knew me, sir," grinned Benton, "when I was nothing but a tube man. What do you think?" "O.K.," Billiard grinned back, and he took off his own coat. It took them a good many hours to examine all of those cases, for they were stacked eight feet high and there were four tiers of them. Each was branded on the end, "25 mm. pellet-gun ammunition, loaded with feroxite—Grand Arsenal, Lunar Base." "Look for a difference, or some secret mark," suggested Bullard in an undertone. It took them a long time to notice it, for it was a minute difference. The markings on the boxes seemed identical despite their critical examination of them. But at length Benton made the discovery. "Here it is, sir. Look. This box has no period after the 'mm', while most of the others have." "Right," said Bullard approvingly, and snaked the box aside. Later they found five others like it. "Now put on your gas mask," directed Bullard, still sweating and panting from the work of heaving the boxes around. He looked at his watch. It had taken half the day to get this far, and he was thankful for his foresight in getting rid of the gunner's gang for so long a time. Otherwise he could not have made so free with the contents of the armory without tipping off his as yet unknown opponents as to the course his investigation was taking. "Now comes the dirty work," commented Bullard, with a wink. He was mopping his forehead. "Go get friend Carrick, the pharmacist's mate, for me. Never mind a gas mask, but bring along a strait jacket." In due time Benton reappeared with Carrick behind him. His captain talked to him in low tones for a minute and Carrick's features brightened. "Yes, sir," he said, "this." And he scribbled a prescription on a strip of paper. "Thanks," said the skipper, dryly. "Now, Carrick, would you mind letting us strap you up in that thing?" pointing to the strait jacket. "Er ... uh ... no, sir," said Carrick hesitantly, looking hopefully at Benton, trusting he would get a clue. He admired his captain and all that, but in these days of mass insanity how could a fellow tell? Maybe the skipper had gone nuts, too. Else, why would he be dirty and sweaty in a deserted armory and make screwy propositions like the one he had just made about making half the crew sick as dogs, and on top of that suggesting that his chief pharmacist's mate strap himself into a strait jacket? "Do him up, Benton," was all that Captain Bullard said. And then he began hunting around for a case opener. The next thing on the agenda was to pry the lids off the boxes with the un- perioded "mm's" so neatly that a subsequent inspection would not reveal that it had been done. BY the time Carrick was done up and lashed to a stanchion, the first box was open and a cascade of brass cartridges had been spilled out onto the deck. "Now a bullet jack, Benton, and be sure your gas mask is on tight," called Bullard, breathless with anticipation. 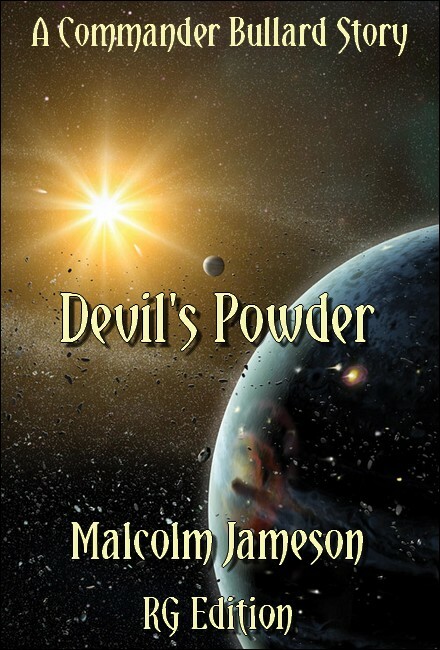 An instant later he had pried an explosive pellet from the first cartridge case in his hand and had spilled out into his palm a little pile of bluish powder. "Ah, sweet papa—it's heavenly," cooed Carrick, the moment it was shoved under his nose. And the two stern onlookers saw his arms writhe under their tight fastenings and the muscles of his jaw twitch in hungry anticipation. "You'd like some?" queried the captain, watching him like a hawk. "Like it!" screamed Carrick, struggling with his binding harness. "Why, you gilt-striped stuffed-shirt, I'd murder you just for another sniff of it. I'd give a year's pay, I'd give—"
Bullard withdrew his hand, watching his captive narrowly. "O.K.," he said soothingly. "You'll have plenty of sniffs. But before I give them to you I want just one thing. Can you match that odor?" "No, no!" wailed Carrick. "There's nothing like it under Heaven," and he slobbered and renewed his writhings. There followed a long and patient interview, sputtering on Carrick's part, smooth and beguiling on Bullard's, while Benton looked on, not quite getting what it was all about. Eventually a deal was made. "Oh, I'll try—I'll try, sir," wept Carrick, at last, and after more soothing promises he pulled himself together enough to dictate a list of ingredients that might do the trick. A moment later Benton was on his way to the dispensary with the list of materials and equipment—vials, test tubes and certain small amounts of essential oils. A bit after that he and his captain were busy compounding, under the frantic eyes of their trussed-up prisoner, the mighty potion. "Ah, sweet—sweet," declared Carrick, blissfully, after the fourth unsuccessful try. "I'd sell my soul for that." They gave him a taste and he gagged. Then, after some time of watching, they unloosed him. "Now mind you," reminded the captain, sharply, as the benumbed Carrick tumbled out of his bindings, "not a word of this to anybody. Blend this odor with the prescription we first talked of, reduce it to powder and give it back to me. Heaven will have to wait." "Aye, aye, sir," said the humbled Carrick, thoroughly subdued. He had a cloudy memory of the extravagances he had just uttered and was ashamed to the uttermost. He gazed unseeingly at the tightly sealed bottles of blue powder that stood about the floor and the pile of empty cartridge cases and boxes full of feroxite pellets. "Within the hour?" reminded Captain Bullard. "Oh, yes, sir," assured his chief pharmacist's mate. "I'll get at it at once." Then, with a hangdog air be added, "It's funny how a thing that smells so good should taste so lousy." "It might be better to tone the taste a little. Can you do that?" While Carrick was gone the captain and Benton unloaded the rest of the doped cartridges and took careful photographs of every stage, not neglecting the brandings on the ends of the packing cases which also showed the number of the packer. Bullard sat down and scribbled out a message to the Director of the I.B.I. Trail packer number KG-8167 of Grand Arsenal, Lunar Base, for contact with main squeeze drug racket. Stuff going out in form of ammunition. Telephotos herewith. Note absence of period after 'mm' on marking. We are taking measures to apprehend peddlers; advise other ships do same. "Here, slap this and these shots into the televisor. When you get 'acknowledge' come on back here. We are only half done." Benton took the message and the cameras and left, and so did Bullard for a few minutes. He went to lock the telltale dope powder in his personal safe. By the time they were both back, Carrick was there with his can of substitute powder. It took them the rest of the day, working like demons, to reload the cartridges and fit the bullets back in. Then they repacked the cases, stacked them precisely as they had found them, locked up the armory and called it a day. "I still don't get—" began Benton, having sweat like a horse all day and witnessed the unorthodox handling of his pal Carrick. "You will," grunted Bullard with grim humor. "You've lived in the fo'c's'le, Benton—what would you do if a shipmate crossed you? Run to the skipper and tattle?" "Not by a damnsite, sir. I'd—"
"Exactly." Bullard yawned. "See you in the morning, Benton." THE diving party found no traces of the lost Centurion, but that night there were no new cases of psychosis. Moore and Fraser were aching to know what it was all about, as was the doctor, but they did not dare ask. Later, Bullard sent for Moore and told him to send range parties ashore again tomorrow. "This time I want our old Pollux men to go on the firing line. Sure, I know they are all qualified marksmen or better, but a refresher course won't hurt them. And as you go out, tell the surgeon to step in." When the doctor came he faced a skipper who had lost some of the worried expression of the day before. Indeed, there seemed to be a hint of a twinkle in his eye. "Listen, doc. You are in for a bad night tomorrow, I think, but don't let it trouble you. I fear a wave of—well, let's call it ptomaine—but it will pass. For the sake of your own reputation, it is just as well you know no more about it than that. All you have to do is keep a straight face, be sympathetic, ask 'em no questions, but by all means keep an accurate list of the sick." Bullard let the puzzled doctor go, and then dismissed the current troubles from his mind. For twenty-four hours he devoted himself to catching up on the ship's correspondence. The veteran Polliwogs duly went on the range, fired, and came back again. It was an uneventful day. And that night was another night without a single skyman suddenly turning to a raving maniac. But it would be untrue to say that it was a quiet night. It must have been a little past eight bells when the first case broke. It was a skyman, second class, previously disrated for bad conduct. He began wailing and moaning about an excruciating bellyache, and a few minutes later he was groveling on the deck, retching and vomiting and swearing his last hour had come. He was a very, very sick man. And hardly had they dragged him off to the sickbay and emptied him out by means of a stomach pump, when there was another. And another. And another. Long before dawn the sickbay was jammed with them and extra cots had been laid just outside. Bullard's forecast had proved correct. The doctor and his helpers had a busy time. But by daylight it was all over, and men by groups began leaving the sickbay for duty. They were a crestfallen, shame- faced crowd, but there was blood in their eye. "Now what?" asked Moore. He was beginning to be fed up with the devious ways of this new skipper, who after all was no older than himself. "Wait," said Bullard, nonchalantly. Then added, "Let's have an inspection of the crew in the morning. I'd like to look over these new men." THE time for inspection duly came, and Bullard walked down the silent rows of men, studying them carefully, one by one. In the second division he took two looks at their gunner's mate. Both his eyes were blackened and swollen almost shut, and when he walked he limped. "What happened to you?" asked Bullard, sharply. "Slipped on a ladder, sir, and fell." Bullard turned to his master-at-arms. "This is one of them. Double irons and into the brig!" "Yes, sir. Come on, buddy. You're done." The amazed petty officer allowed himself to be led away. In the fourth division they came upon another petty officer, this one with badly skinned knuckles on one hand, and the other arm in a sling. His ear looked as if it had been chewed. "Cell 2 for him," said Bullard, briefly. Deeper in the ship another pair of gunners' mates were found, similarly decorated. They, too, were promptly put in durance vile. Except for the many bruised and raw knuckles exhibited by the sullen victims of the recent ptomaine epidemic, there was little else about the inspection to attract attention. After it was over, Bullard took Moore and the doctor aside. "From this point you can finish," he told his executive, and sketched out the high spots of what he had done. "So that's where those men got hold of methylene blue," exclaimed the doctor, admiringly. "Yes. And the ipecac and essence of Croton oil and some other truck," grinned Bullard. "I hope you are prepared to identify the would-be buyers, if it comes to that." "I am," said the doctor. "But these four you slammed into the brig without so much as a word?" Moore wanted to know. "Elementary skyman psychology, my dear Moore," said his captain, pleasantly. "Sell a gob a bill of goods and you have to deliver, or else. They shelled out for dope and look what they got. Naturally, their first impulse was to take it out of the seller's hide. It saves us the embarrassment of bringing the whole nine of the range petty officers up on trial and then having five of them acquitted. Now we know who's who." "Oh," said Moore. "I hadn't thought of that." And he recalled with some satisfaction how well decorated that last chiseling gunner's mate had been. "But what about Gunner Stosk? Wasn't he the king-pin?" "Mr. Stosk is at the moment suffering from three fractured ribs, the loss of five incisors, a dislocated jaw, and various contusions. He is, in short, in bed—a very disillusioned man. You see, our masters-at-arms had instructions to ignore personal scraps during the night. After the four petty officers got theirs, what should be more natural but for them to pass it on? If they had double-crossed anybody, it was only because they had been double-crossed themselves. Hence the condition of our erstwhile gunner, Stosk." "So you have them all—witnesses, the peddlers, and the distributor? It's a regular house-that-Jack-built thing." Moore had forgiven Bullard his mysterious, off-the-record investigation. Now he saw how perfect the trap was. "Too bad we couldn't snag the louse who originally supplied the stuff." "Oh," said Captain Bullard, serenely, "as to that, it seems we did. You see, Stosk never knew I spent the day in the armory while he was diving for the Centurion. When his gang backfired on him he jumped to the conclusion that he had been double- crossed himself—that the Lunar crowd had shipped him phony dope. So he told me the full story. It went off four hours ago to the I.B.I. Here's the answer that just came back." The two officers read the ethergram and whistled softly. "And that's that," said Bullard. "Now let's get back to running the old Pollux. What else is on your mind, Moore?"